In a galaxy somewhat close to Earth, there once was a jacker… a star jacker. 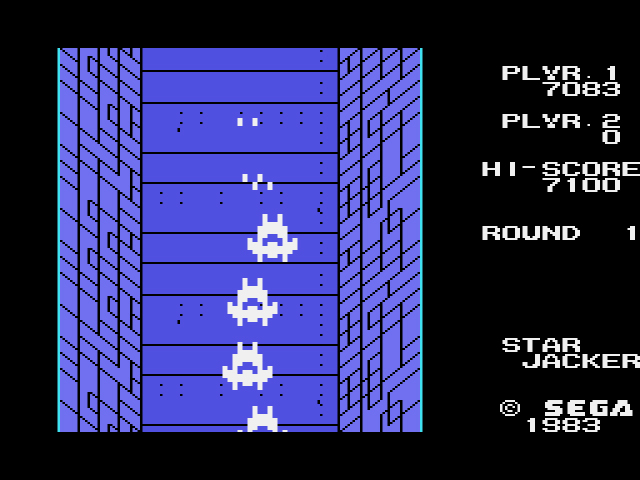 According to SegaRetro.org, Star Jacker was released in Japan on July 15th, 1983 – the same day that the SG-1000 launched in Japan. If the date is accurate, this means that the nine games that preceded Star Jacker were launch titles as well. Given that twenty-eight games were released for the SG-1000 in 1983, having ten games (if not more) ready to go on launch day is impressive. To compare, Nintendo only produced nine games for the Famicom in 1983, as a whole. And yet, despite having less games and an early Famicom recall, Nintendo ultimately won the sales battle between the Famicom and the SG-1000. As always, the reason comes down to games. Sega may have had more games for their system than Nintendo, but Nintendo had the games people wanted to play. Donkey Kong, Donkey Kong Jr., Popeye, Mario Bros., among others, were immaculate arcade ports. Congo Bongo, on the other hand, was missing two of its four stages and resembled a toddler’s “Congo Bongo” coloring book than the actual arcade game. Older arcade ports like Borderline, N-Sub, and Safari Hunting felt both visually compromised and dull, and titles like Mahjong and Tsumeshogi, while good for what they were, catered to a narrow audience. If Sega wished to succeed in the home market, they needed a game – arcade port or otherwise – that could hold its own with Nintendo. In space, no one can see you swivel. 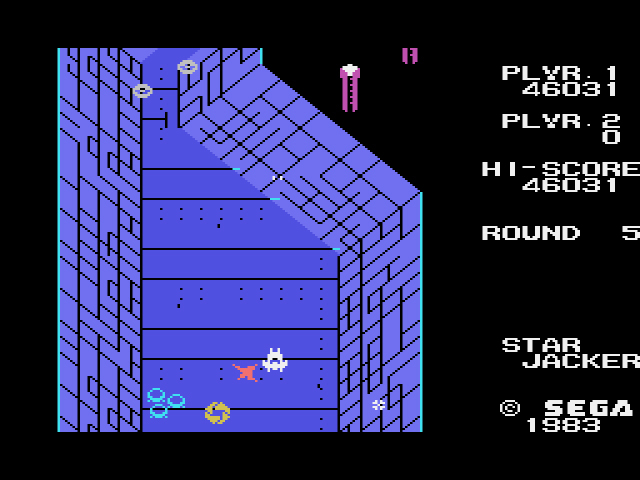 Enter Star Jacker, the first SG-1000 game I’ve played that takes advantage of the system while remaining fun in the process. It’s a vertically scrolling shoot-em-up with a distinct hook: you control all four of your space ships/lives at the same time. The ships are hooked together in a caterpillar formation, and they shoot bullets and drop bombs independently of one another as they bob and weave across the screen. If any ship is hit, regardless of its placement in the formation, it’s destroyed and the game continues until all ships are destroyed. There are two fields of play, each with its own energetic musical ditty: each stage begins in the dark recesses of outer space, then moves forward into some sort of space station cubby with what appear to be light posts on the outer edges. Both fields are teeming with your standard shmup enemies circa early 80s: circles, triangles, the occasional green space ship, but mostly shapes that twist about the screen in awkward, jagged movements. Get halfway into each level with two or more ships intact and a boss will appear, a red turret that spits out white pellets and dominates the screen. Destroy it, and your ships will enlarge to ridiculous proportions, speed through the rest of the level without being hurt and collect massive amounts of points along the way. Oh yes, we stay fresh. The first time this ship enlargement occurred, I thought I had broken Star Jacker. No title up to this point in the SG-1000 library had presented me with an in-game gesture so weird and unexpected. This strange happening is the only one of its kind within the game, but by this point, Star Jacker had already proved itself as something special. Besides the unique caterpillar ship formation and the aforementioned ship enlargement, the game feels like a technological marvel compared to other SG-1000 titles. The graphics are crisp, the controls are tight, and the gameplay is fast. Borderline had displayed vertical scrolling that was choppy at best, but Star Jacker moves almost as smoothly as its arcade counterpart. Given the large amount of enemies the game has on-screen at any given time, such smooth scrolling is doubly impressive. Limited color palette aside, Star Jacker could pass for an early Famicom game; no small feat, given the difference in the two systems’ specs. 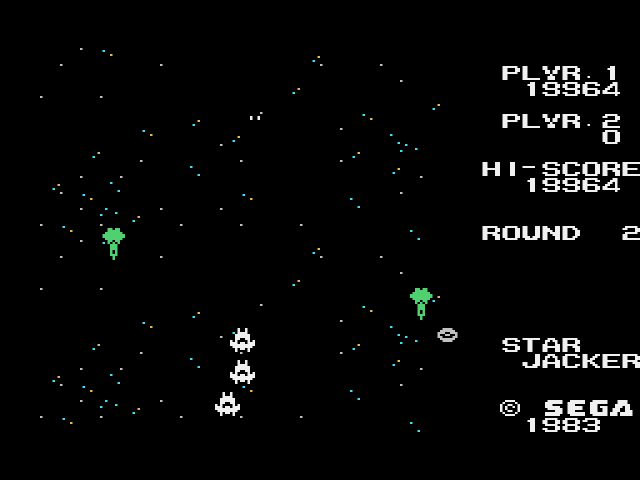 The arcade version of Star Jacker is graphically impressive – it’s one of the first arcade games to use Sega’s System 1 board – but runs slower than the SG-1000 version, and you only start with three ships instead of four. I also found the hit detection for the bullets to be lacking. Several times I swore I hit an enemy with my bullets, but it didn’t explode, causing my ship to plow straight into them. Based on my time spent with both of them, I prefer the SG-1000 version for its speed and the extra ship. Lots of weird crap happening. Sega spared no expense. I mentioned earlier that if Sega wished to succeed in the home market, they needed a game that could hold its own against Nintendo’s storied library. Star Jacker should have been that game. It’s fun, creative, bursting with energy and, if you squint right, graphically on par with what the Famicom was putting out at the same time. And yet, unlike Donkey Kong, Donkey Kong Jr., and Popeye, all of which shared equal amounts of the Famicom spotlight for a month or so, Star Jacker had to share shelf space with a host of other SG-1000 games all at once, many of them mediocre at best; getting lost in the shuffle of crap was a real possibility. Given how little information there is about the arcade Star Jacker on the Internet, I don’t believe the game was popular, which likely hindered the SG-1000 port’s sales and any potential marketing campaign around the port. Star Jacker may have been the best SG-1000 game to pit against the Famicom lineup, but to the best of my knowledge, Sega chose not to – or any other game for that matter. Indeed “unlucky” seems to define the SG-1000’s lifespan and output, compared to the overwhelming success of Nintendo’s Famicom. Then again, despite selling a fraction of what the Famicom sold, the SG-1000 was still a financial win for Sega because Sega didn’t expect the console to move a ton of units; their heart remained firmly in the arcades until the Genesis days. Star Jacker‘s possible crossover appeal and Nintendo’s unwavering victories be damned, Sega would continue to do things their way with the SG-1000 – releasing console games both good and bad at quick speeds – as long as there was profit to be had. Nice review, I like when you write insightful stuff. Knowing a bit more about the game and the environment it was set on adds a lot of value to the review. Thanks! The games themselves don’t always inspire insight, but Star Jacker did. This reminds me of Sega’s arcade game Tac/Scan which was on the PS2 Mega Drive/Genesis Collection. Wonder if this is an adaption of that title ? Tac/Scan came a bit earlier than Star Jacker, actually; at least according to Wikipedia. Ok I’m playing catch up here (been reading your blog from the start, but I’ve finally got myself round to downloading and playing the games). Your review is on the money, this game is great ! Miles ahead of the other SG games up-to this point, wouldn’t look out of place on the NES. 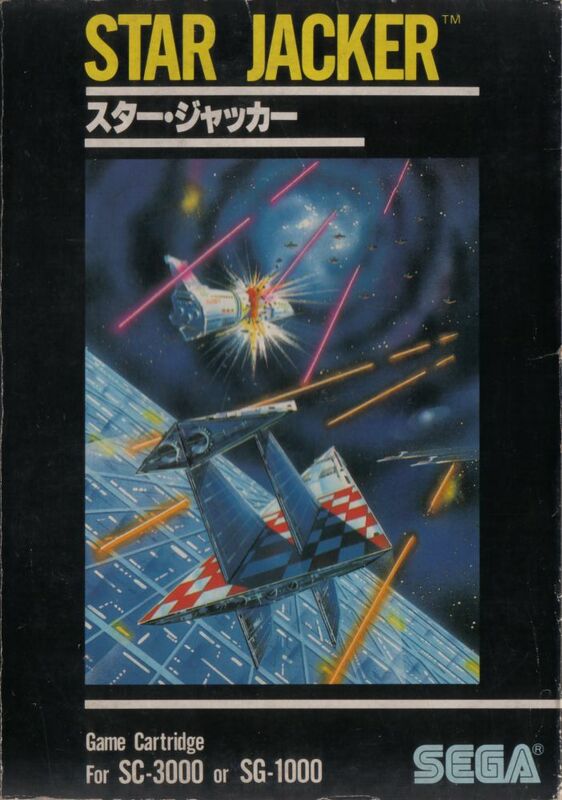 Yeah, Sega must have been on a roll with Star Jacker. It wouldn’t last, but at least we got a decent shump out of it. I just recently listened to the podcast where you discussed this game and mentioned how you were wondering who designed the game and what they went on to do. Sadly, Google didn’t turn up much for me, as the primary designers really only seem to have Starjacker in their credits. But the game itself really reminds of the later high-speed shooters created by Compile such as Zanac and Aleste. Maybe it’s all a coincidence!